Learn more about wht Night Owl Extreme HD Surveillance System with pricing, a list of features, customer reviews and FAQs. 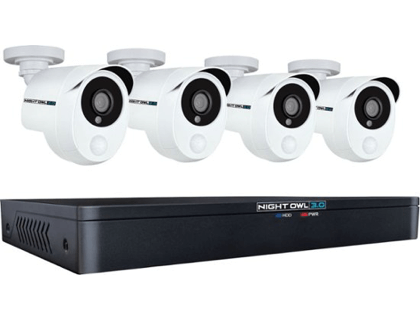 The Night Owl - Extreme HD 8-Channel, 4-Camera Wired 1TB DVR Surveillance System is a complete security camera system for indoor or outdoor use. The system includes four adjustable cameras and a DVR unit for video recording. Pros: Clear, crisp video images. Heat and motion detection. Cons: More expensive than other systems. Steep cost for additional cameras. Bottomline: A dependable security camera system that can capture and record suspicious activity 24/7. What is the price for the Night Owl - Extreme HD 8-Channel, 4-Camera Wired 1TB DVR Surveillance System? The 1TB system with four cameras and a DVR costs $349.99. Where can I buy the Night Owl - Extreme HD 8-Channel, 4-Camera Wired 1TB DVR Surveillance System? All Night Owl products are available on Amazon. What are some Night Owl - Extreme HD 8-Channel, 4-Camera Wired 1TB DVR Surveillance System alternatives? Can you add cameras to the Night Owl DVR kit? Yes, you can add additional Night Owl cameras if you want to expand your system. An 8-channel system allows you to have up to 8 cameras. I'll add my two cents, as an owner of these cameras. For the price, this is amazing. A few months ago I bought this, with only four cameras included. This is ready out of the box with no additional accessories needed.The only grip is I wish it had more features, like infrared, but IIRC the company does sell cameras with that ability. The quality is clear and always shows in SD to save bandwidth so you have to manually set the stream to HD each time. The chat support is almost 24/7 and very helpful for any questions.